TerraCycle will recycle your old plastic pens (felt tips and other types of plastic pen). It simply involves a collection box (any box) and downloading a prepaid label. To download the free label, you do have to sign up to TerraCycle but it is very easy, only requires basic contact information and, by so doing, you can earn points towards rewards for your school. You can then arrange a pickup with UPS – by ringing 03457 877 877 or take your box to a UPS collection point (local addresses below). Clicking the ‘how it works’ button and the FAQs will give you useful information. 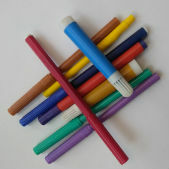 Parents could also be encouraged to send their used plastic pens into school for recycling. Please note that the above UPS phone number and the following addresses as UPS pick up points were checked and were correct on 8th October 2018.